In the preliminary stage of solar project evaluation, it is desirable to make a reliable calculation of PV electricity potential without having to invest too much time or resources. The pvPlanner software helps streamline the pre-feasibility process by providing access to reliable PV potential information within minutes. Accurate solar radiation and temperature data are a key pre-requisite for reliable PV yield calculation. pvPlanner makes use of validated solar radiation data that have lower uncertainty compared to other satellite derived irradiation data sources. 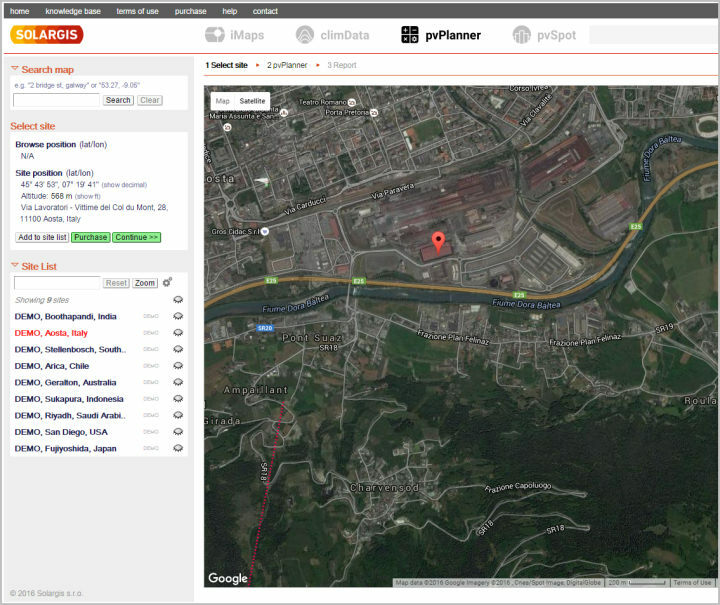 pvPlanner was designed for engineers as well as non-engineers. Options for user inputs have been simplified in a way that accuracy of results are not compromised. This means that pvPlanner is simple but powerful. In-built digital terrain data with 90m resolution enables automatic calculation of shading losses from nearby hills/mountains. Horizon editor also allows you to manually edit the horizon and import horizon data measured at project site. You can download pvPlanner reports in Spanish, Portuguese, Japanese, French, and 10 other regional languages. You can also customize the reports by importing your company logo. 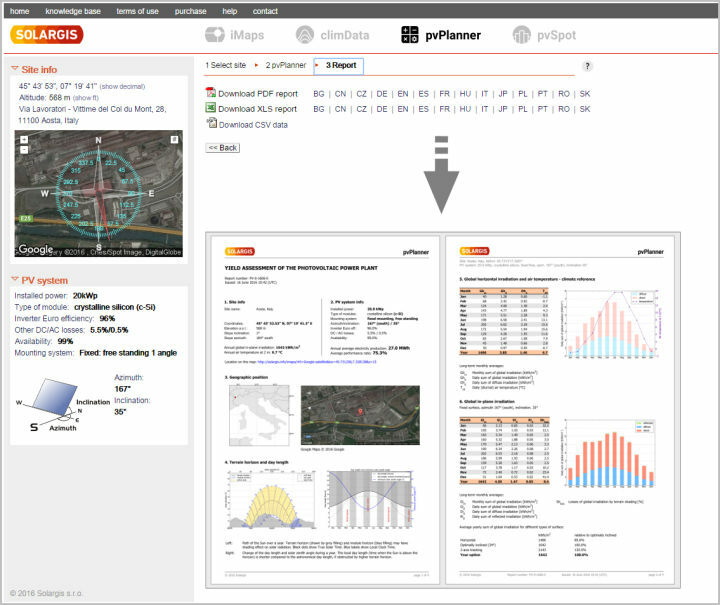 pvPlanner service is also available as an API – allowing you to access SolarGIS data via 3 rd party apps. The API service is also useful for quick assessment of long-term energy production of a large portfolio of distributed PV systems. Set up basic properties of PV technology, mounting system, location horizon and run calculation. You can play and fine-tune the settings and recalculate results. Does pvPlanner account for different energy conversion efficiencies of modules available on the market ? pvPlanner allows user to choose from the most common type of modules, including cSi, CdTe, and CIS. For cSi modules, pvPlanner uses a generic power rating model, which is based on data from indoor measurements for 18 different mono and poly crystalline PV modules coming from different manufacturers. In a research study it was found that the model output of the 18 modules varies with a standard deviation(SD) of 1.22%. The variability between modules of different types is thus smaller than the uncertainty normally found in the total solar irradiation per year for a given site. Therefore, we consider that use of a generic model is a reasonable approach to take in the pre-feasibility phase of a solar energy project. I want to design a PV system that would help meet a demand of 100,000 kWh per month. 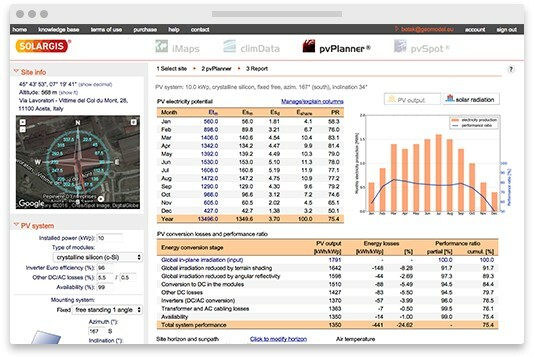 Can pvPlanner calculate the PV plant capacity needed? 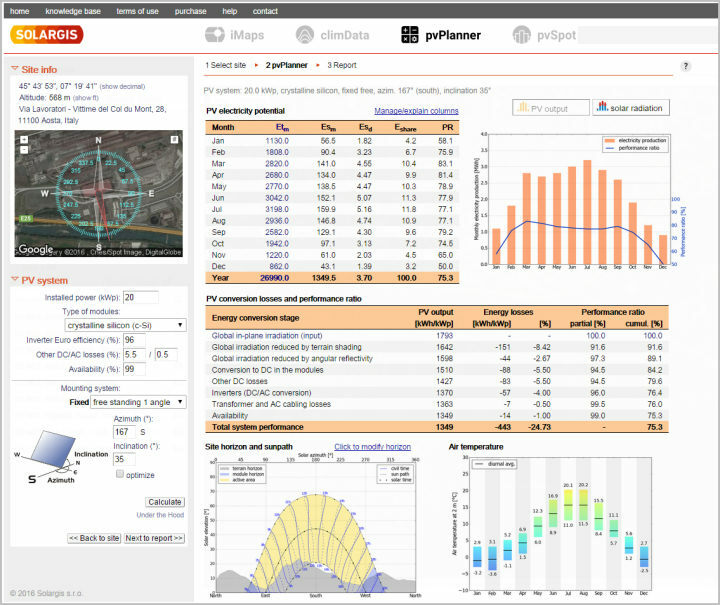 Yes, pvPlanner can help to determine suitable size of PV system required to meet a required demand. As first step, output of a 1kW system can be calculated and then system size can be multiplied by suitable number to arrive at final desired output.